Before your first visit, we will need you to complete a health questionnaire and history. It will save you a lot of time if you complete this ahead of time online and have it ready when you come in for your first visit. In every doctor/patient relationship, communication is imperative. The first time we meet a new patient, we will take a thorough health history. 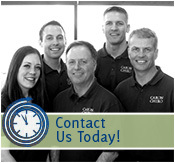 At Caron Chiropractic Clinic, P.A., we listen to you. This helps us to pinpoint the actual problem instead of focusing on just the symptoms. We will give you a complete assessment of your condition and make sure that we fully answer any questions you may have. Next, the doctor will perform a comfortable check of your spine, posture and body alignment. In addition, the doctor may examine other areas depending on your specific complaints, for example shoulder, knees, feet, or TMJ. A Report of Findings (ROF) is how the doctor tells you what is out of alignment in your body — this is called a subluxation— and what type of treatment will bring you back to health. If your body is out of alignment you will likely need to make a series of short appointments. By applying precise pressure, warm packs and other comfortable techniques, the doctors can retrain your body back to a more healthful position. The doctors will also help you with suggestions for exercises; nutrition or other changes, which will help you, become pain-free and naturally fit.